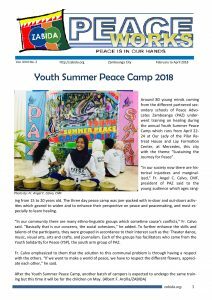 #paz » Zamboanga-Basilan Integrated Development Alliance, Inc. In their non-stop pursuit to mold peace champions in this city, Peace Advocates Zamboanga (PAZ) and the Interreligious Solidarity for Peace (ISP) conferred the Young Peace Weavers Award to 18 deserving graduating senior high school students and 11 graduating tertiary students for this school year, all of whom have made significant contributions to peace in their respective schools and communities. 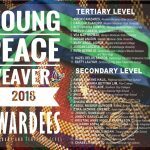 For 17 years now the Young Peace Weavers Award is given annually by PAZ and ISP to the peace-conscious students in high school and college in both public and private schools. 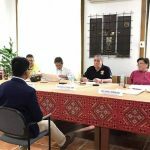 After had been endorsed by their respective schools, the nominees had undergone the selection process with the screening committee whose members are from ISP and PAZ. The major criterion is the active participation of the nominees in efforts in peace building and instilling an awareness of the process towards the culture of peace as against the culture of violence in their schools and communities. While, the 11 awardees from the tertiary level are: Airon Canizares (Western Mindanao State University); Carlo Alejandro (Western Mindanao State University); Sitti Shaira Dompol (Western Mindanao State University); Mervin Cabato (Western Mindanao State University); Vea Mae Guzman (Western Mindanao State University); Aissah Anudin (Western Mindanao State University); Mary Angel Aghon (Winzelle International College); Jordan Lascota (Ateneo de Zamboanga University); Ruth Bermejo (Zamboanga State College of Marine Sciences and Technology); Hazel Delos Santos (Zamboanga City State Polytechnic College) and Raffy Laliyah (Zamboanga City State Polytechnic College). 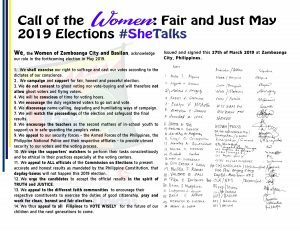 As a response to the invitation of the World Interfaith Harmony Week Celebration, the Interrelgious Solidarity for Peace (ISP) and Peace Advocates Zamboanga (PAZ) in partnership with the City Government of Zamboanga, a Harmony Forum was organized. Given the multicultural nature of the City, the Harmony Forum aimed to broaden and deepen the meaning of harmony. Prof. Noor Saada, Project Manager of Modeling Inter-LGU Alliance for Basilan Project and one of the Peace Weaver 2017 awardees discussed the topic on Understanding the Meaning of Harmony. Thereafter, the participants were divided into groups according to their different faith namely Catholic, Muslim, Evangelical/Protestant and Indigenous Peoples for a workshop to discuss among them how else can they strengthen their relationship with the intra-faith groups and what can they do together for the healing of the interfaith communities. Around 90 community and religious leaders partiicpated at the Harmony forum which was conducted in Centro Latino last 10 February, this City. Another successful story of Logistical Support turn-over ZABIDA-KKI held at Pasonanca Barangay Hall, today February 15, 2018 for both Gender and Development and Sectoral plan implementation and Disaster Risk Reduction and Management. 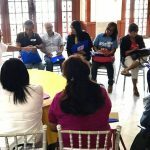 The said activity was attended by the sectoral representatives of the Barangay from the Women, Senior Citizen and Urban Poor sectors. Also present during the turn-over was the Barangay Council of Pasonanca headed by Punong Barangay Hon. Efigenio E. Julian, KKI LGU Coordinators and Manos Unidas Coordinator to the Phillipines Ms. Jessica Del Olmo. 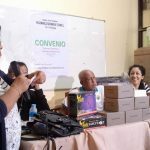 Manos Unidas through ZABIDA-KKI turned-over the following for GAD & Sectoral; Kitchen utensils and equipment and for DRRM; 10 units of Hand Held Radio and 2 set of Safety Belt (Parachute type).